Story and pictures by Tim LaBarge. Pulling into the parking lot at Tryon Creek State Natural Area on the first day of summer camp, you’ll see a collection of children weaving about, saying goodbye to parents, chattering like little birds in a chaotic flock. In time, the flock gets split into smaller teams and they disperse down the trail on their way to a lifetime of memories. 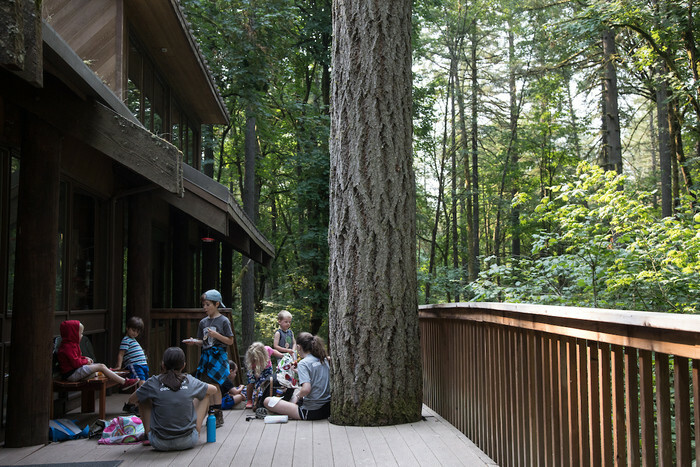 This year, Tryon will welcome nearly 800 campers in its 41st year of offering day camps. The hairstyles and trail fashion have changed since those first camps in the mid-70s, but the wide-eyed look of the camper as she discovers the natural world has not. Encouraging young people to be good stewards of the forest has always been the goal of the camp, and that continues today. The camp director and the camp counselors’ main goal is to provide a safe place to encourage responsible enjoyment of the land. Their activities are designed so campers experience a boost in their confidence and leadership skills as they explore new territory, pushing their boundaries of comfort. Camp Instructor Ian Anderson, known as Phi at camp, encourages that sense of ownership in the park. “Tryon Creek belongs to everyone and owning something means it’s your job to care for it.” In her role as a camp leader, Erin Cathcart sees how the quiet kids begin to open up. She sees how the kids who don’t always feel like super stars at school or on the sports field find success at camp. She watches them become more independent throughout the week, becoming more confident and taking on leadership qualities. Months or years later, she’s seen those same kids meet up at the park for a mini-reunion and to take their families for a walk in the woods to show them where their fort was or where they saw a pileated woodpecker.